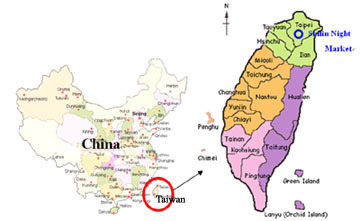 Taiwan is situated off the southeast coast of the Asian continent, about 100 miles across the Taiwan Straits from mainland China. It is one of a string of East Asian islands. The shape of the main island of Taiwan is similar to a sweet potato seen in a south-to-north direction, and therefore, Taiwanese people, especially the Min-nan division, often call themselves "children of the Sweet Potato." There are also other interpretations of the island shape, one of which is a whale in the ocean if viewed in a west-to-east direction, which is a common orientation in ancient maps, plotted either by Western explorers or the Ching Dynasty. “ Ilha Formosa !” - In 1544, the first Portuguese found Taiwan from the sea.